As predicted, I made a skirt to match. Same old pattern. Very quick. This is the first one I have made that isn’t lined, so even quicker. I made it in the afternoon and wore it in the evening. 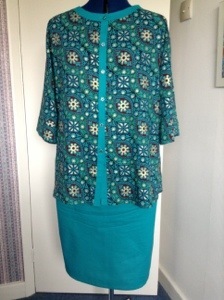 This entry was posted on August 11, 2013 by ann hebden in Sewing, Skirts and tagged Sewing, Skirt.